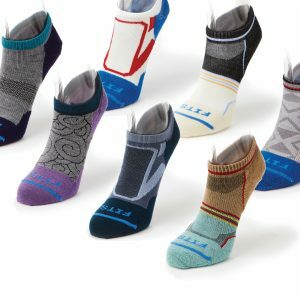 CHATTANOOGA, TN — FITS®, American manufacturers of the best-fitting socks on the market, is excited to announce the launch of their 2019 spring collection featuring eleven new running, hiking and compression sock styles. These new styles offer breathability, moisture-wicking properties and lower profile designs to keep feet cool even in the hottest conditions. The Ultra Light Runner collection is perfect for warm weather outings. Featuring a flat knit design for zero bulk, along with a fully vented top for maximum breathability, this sock allows runners to hit the trail or pavement without being weighed down. The Micro-Light Runner collection is available in Low, Quarter and Mini-Crew heights, and offers support with a barely-there feel. The low-profile design hugs the foot and stays in place, even in the most demanding situations. FITS®’ Light Runner Low and Light Hiker Mini-Crew styles are now available in six new colors and the Cushioned OTC Compression sock is available in three new hues. Customers can find the 2019 spring collection online at www.fitssock.com or in specialty retail stores across the country. All FITS® socks are made in the USA and feature the brand’s patented ‘Full Contact Fit’. For more information about FITS®, visit www.fitssock.com and follow @fitssocks on Instagram and @fitssockco on Facebook. FITS® is a premium sock brand resulting from the collaboration of third and fourth generation textile manufacturers to create the absolute best fitting socks in the marketplace. Utilizing only the best raw materials available, FITS® incorporates innovative, proprietary engineering and technology to create the most comfortable, best-fitting sock in the world. FITS® is driven to create value for both their retail partners and consumers by delivering a superior product at a fair price that enhances personal experiences in the outdoors, at the office, or simply relaxing with friends and family. Contact FITS® at (888)421-3487 or at fitssock.com.